Had a great time, we needed the getaway and loved the cabin, had a super time in the hot tub. Couple recommendations would be to have wifi password in cabin, we had no idea what the password was and checkout or check in time. By checking in and not being able to go there until 4 that means you pay for just 8 hours the first day...why not change check out to 2 or something close? The cabin was perfect, clean and cozy. The roof leaked but nobody offered us a discount or an optional different cabin. The outdoor grill was not what I was expecting “it should probably be replaced”. Other than a power outage and a roof leak this was the perfect getaway. Clean and cozy!!!! This is a nice, cozy cabin for 2; perfect for a romantic getaway, or honeymoon. There were issues when we first checked in, but after lengthy conversation with the manager, the issues were resolved. We enjoyed our stay after issues were resolved. Suggestions for the homeowners: need new/different box springs, need fireplace tools since it is a wood-burning fireplace, would be nice to have a divided kitchen sink or extra container to put dish water in and have room to rinse without filling sink up with water while doing dishes, a dish drainer would be nice to have, would've been nice to have a broom on hand to get rid of spider webs and spiders. Maintenance person came with a broom to knock them down and then we sprayed to keep spiders from rebuilding during our stay. Recommend to have pest control done more often. Suggestions for Cabins USA: cleaners need to do a better job of cleaning. There was a "film" in the commode where it appeared it had not been cleaned for several weeks. Need to mop or use a swiffer under the bed to cut down on dust in the cabin. For week long stays, recommend having additional trash bags on hand for kitchen and bathroom. When we used the washer and dryer, the dryer vent was full of lint. Cleaners should check that at each cleaning to cut down on the risk of fire hazard when using. Note, renters should be more responsible too, that if they use the dryer to check/clean the filter. We arrived in Pigeon Forge later than we had planned and called Cabins USA. The office was open much later than what the Web site Google stated. Check in took about 5 minutes and check out was made with a phone call. Passion Point cabin was clean and very well stocked with everything we needed. We had call to get the WiFi password, but that went smooth as well. The location is private and only about 10 to 15 minutes from Pigeon Forge. The only problem we had was large black with yellow stripped spiders with large webs everywhere outside, on all 4 sides of the cabin. The next day after we arrived, I purchased a can of hornet and wasp killer. Later that evening I went on a hunting adventure around the outside of the cabin for the black and yellow critters. I had around 90% success. I sprayed spiders and knocked down webs for about an hour or so. I couldn't reach 4 or 5 that had webs on the higher windows out on the deck over the hot tub roof. I was going to keep the biggest one to mount and hang over my fireplace at home, but the lady of our house wouldn't even think about it....Lol. (Just Kidding). We are from West Virginia and we are a custom to all kinds of critters trying to survive so this really didn't bother us too much as we knew how to take care of the problem our selves. We usually don't see this many "huge" spiders, but still not suprised given the privacy this cabin has. So don't let this outside spider story keep you from renting this cabin because it was a minor problem and 90% of it was taken care of. I'm sure the cabin owner will take care of the other 10% once they know about it. By the way...there was "NO" spiders spotted inside during our 5 day stay. Passion Point cabin is perfect for a couple....clean, lots of room, everything worked as it should, plus the price for 5 days were as cheap, or cheaper, than a hotel. So if you want a cabin without a dozen more cabins watching everything you do...this is the perfect cabin for you and your other. I met the cleaning crew on our last day and they were the nicest people you will meet, so 10/10 for the cleaning crew also. I would highly recommend this cabin thru Cabins USA. Beautiful setting and clean cabin. However back deck is rotting and supports under the hot tub and deck are subpar. Only went out on the deck once and did not go back out after supports were noted. Really unsafe. Very quite. Really nice. First time we have not had to clean a cable useing Cabins USA. Thank you to all at CabinsUSA. See you in November. Relaxing and secluded. I loved it and will definitely return. Only negative: the hot tub needs cleaned badly. My wife and I were very pleased with our stay. Pleasantly surprised, did not expect the amenities and the incredible chalet for the price. When I first booked the property, I was a little nervous about the one room. Once we arrived, the chalet was spacious and was perfect for two people. The chalet was perfect for our 5 day trip. I would highly recommend this type of chalet to any couple, the price was great and beat any hotel with the same amenities. Thank you and we will definitely be staying again. My husband and I went on our honeymoon here and we loved it.The cabin was very clean and beautiful and the amenities were great especially the hot tub.We had a blast and can’t wait to come back! The cabin was exactly what I was hoping it was- beautiful, peaceful, quaint, and very charming! Passion Pointe was perfect for us! Quaint and cozy. The back deck offers plenty of privacy and we enjoyed the hot tub (although lid is heavy and awkward to move). We needed some local information to take care of some business and the office staff offered helpful information. We didn't require much but kitchen was shocked well with dishes. I would definitely recommend to friends and we will likely return. Very well pleased with everything. Cabin was very nice, clean and tidy. also close to town. Would recommend cabin to others. This was our 4th year to stay at Passion Pointe. We stayed for our honeymoon and returned every year since. We liked the express check in and check out. This time however we did notice a numerous amount of spiders. Everything else was perfect. Thank you for continuing to choose Cabins USA and Passion Pointe! We here at Cabins USA work hard to make sure each of our guests have the same great stay you enjoyed while vacationing in the Smokies. Thank you again for continuing to choose Cabins USA and we look forward to seeing you again soon! Great cabin for a nice getaway with my wife. This was our first getaway and before we left she was ready to start planning our next one. I am so happy to hear that you and your wife enjoyed staying in Passion Pointe! When you are ready to stay with us again, please mention you are a return guest for an additional discount. Thank you for choosing Cabins USA and we look forward to having you as our guest again! I am so happy to hear that you enjoyed your stay in Passions Pointe! When you are ready to stay with us again, please mention you are a return guest for an additional discount. Thank you for choosing Cabins USA and we look forward to seeing you again soon! I am so happy to hear that you enjoyed your stay in Passion Pointe! We here at Cabins USA work hard to make sure each of our guests have the best stay possible while vacationing in the Smokies. When you are ready to stay with us again, please mention you are a return guest for an additional discount. Thank you again for your review and thank you for choosing Cabins USA! This cabin was a wonderful place to stay for me and my wife. It is located in a quiet, secluded area. The only issue we had was with the cleanliness of the hot tub. There was some type of sediment or sand... something... all in the hot tub. Because we weren't sure, we did not use the hot tub. We did report to maintenance as we checked out. Other than that issue, we had a wonderful stay! We have stayed in various cabins by Cabins USA many times and have had few issues, if any. We will be staying again! Thanks! Thank you for taking the time to let us know about your recent stay in Passion Pointe! We here at Cabins USA work hard to make sure each of our guests have the same great stay you enjoyed while vacationing in the Smokies. Thank you for letting us know about the hot tub. Your comments have been forwarded to our housekeeping department to be addressed. When you are ready to stay with us again, please mention you are a return guest for an additional discount. Thank you again for your review and thank you for choosing Cabins USA! Love the cabin. It is in a great location and we will be back. Thank you for all of your kind words! We here at Cabins USA work hard to make sure each of our guests have the best stay possible when vacationing in the Smokies. When you are ready to stay with us again, please mention you are a return guest for an additional discount. Thank you again for your review and thank you for choosing Cabins USA! We loved the cabin, it was the perfect size and it was minutes from the strip in Pigeon Forge. The cabin was clean and comfy. We had a really good time. Everything was just perfect. Thanks for letting us stay! I am so happy to hear that you enjoyed your stay in Passions Pointe! When you are ready to stay with us again, please mention you are a return guest for an additional discount. Thank you choosing Cabins USA and we look forward to having you as our guest again! Very clean and cozy. Close to town but quite and peaceful. We didn't like the k-cup coffee maker so we bought a cheap one in town. Other then that it was a excellent spot for our 29th anniversary .We would stay again and will recommend it to family and friends. Thank you for an enjoyable 2 days. Thank you for taking the time to let us know about your recent stay in Passion Pointe! We here at Cabins USA work hard to make sure each of our guests have the best stay possible while vacationing in the Smokies. When you are ready to stay with us again, please mention you are a return guest for an additional discount. Thank you for choosing Cabins USA and we look forward to having you as our guest again! This cabin was cozy and clean and had everything we could have possibly wanted or needed! We could not have asked for a better cabin to visit Tennessee with and will be renting with Cabins USA in the future. I am so happy to hear that you enjoyed your stay in Passion Pointe! 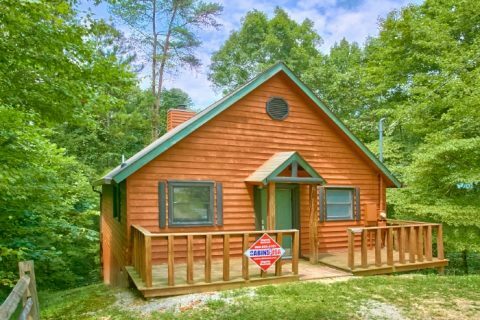 We here at Cabins USA work hard to make sure that each of our guests have the same great stay you enjoyed while vacationing in the Smokies. When you are ready to stay with us again, please mention you are a return guest for an additional discount. Thank you again for your review and thank you for choosing Cabins USA! Stayed for 3 nights. Enjoyed every minute. I cannot think of one thing to complain about. Loved it!! It was quiet except the bouncy floors!!! It was pretty comfortable except the hideaway couch!!! Loved all the appliances!!!! We didn't like to walk through mud on our way into the front door when it rained! But other than that overall we loved the cabin and our stay!!!! My wife and I chose Passion Pointe with our 1 year old son in mind. We wanted a one floor cabin for safety reasons. We enjoyed our stay, it was comfortable and directions to the cabin were easy to follow. Only one complaint, there seems to be a critter underneath the cabin or inside the walls. We heard it every night. First night we thought it was inside the cabin and had us worried. However, great cabin overall. I am so happy to hear that you and your family enjoyed your stay in Passion Pointe! Thank you for letting us know about the critter that is under the cabin. Pest control will be notified so we can take care of that issue. When you are ready to stay with us again, please mention you are a return guest for an additional discount. Thank you again for your review and thank you for choosing Cabins USA! Great cabin and a great price for the New Years holiday! I am so happy to hear that you enjoyed your stay in Passion Pointe! When you are ready to stay with us again, please mention you are a return guest for an additional discount. Thank you again for your review and thank you for choosing Cabins USA! Cabin is great but way up on the mountain. Thank you for taking the time to let us know about your recent stay. We here at Cabins USA work hard to make sure that each of our guests have the same great stay you enjoyed. When you are ready to stay with us again, please mention you are a return guest for an additional discount. Our reservationists will also be more than happy to help you find a cabin that is not so high. Thank you again for your review and thank you for choosing Cabins USA! We loved our stay . The cabin was clean, bed comfy and had everything we needed. It was cosy and romantic? We will definitely will be back. I am so happy to hear that you enjoyed your stay in Passion Point! When you are ready to stay with us again, please mention you are a return guest for an additional discount. Thank you again for your review and we look forward to having you as our guest again! I am so happy to hear that you enjoyed your stay in Passion Pointe! We here at Cabins USA work hard to make sure that each of our guests have the same great stay you enjoyed while vacationing in the Smokies. When you are ready to stay with us again, please let our reservationists know you are a return guest for an additional discount. Thank you again for your review and thank you for choosing Cabins USA! I am happy to hear that you enjoyed your stay in Passion Pointe. When you are ready to stay with us again, please let our reservationists know you are a return guest for an additional discount. Thank you again for your review and we look forward to having you as our guest again! A great location and a great place. Would absolutely stay there again. Only two comments. There was no oil or salt or basic things like that and no plastic containers, so we had to get our own. The biggest problem though was that the trash can is not well secured so we had visits from bears, which posed a problem when we returned from a walk and the bears were between us and the cabin. We noticed other cabins with metal around the trash cans, and that seemed more reasonable. I am so happy to hear that you enjoyed staying in Passion Point! I apologize for the issues you had with the bears. Those have been forwarded on to our Owner Liaisons and they will be speaking with the owner of the cabin about the possibility of getting bear proof containers. Thank you again for your review and thank you for choosing Cabins USA! Passion Pointe is Amazing! It feels like home away from home! I am so happy to hear that you enjoyed staying Passion Pointe! When you are ready to stay with us again, please let our reservationists know you are a return guest for an additional discount. Thank you for choosing Cabins USA and we look forward to seeing you again soon! When we checked in, there were two clerks working. The girl who checked us in was extremely nice and helpful. However, her coworker was very rude and disrespectful to the young lady checking us in to the point, we were embarrassed for the girl checking us in. Our TV went out and we reported it at 11:00 am and was told someone would be there soon to fix it. The following day, 25 hours later, we were told he was on his way. When we checked out, no one had ever come. We were given every excuse from lots of AC being down, etc. we loved Passion Point, the cleanliness, location and all to do with the cabin, but the service was very disappointing to not have TV and be told maintenance was on their way and never show up. I would definitely recommend the cabin, but service is poor. This was our second reservation at Passion Pointe. We plan to return every year. It was perfect for our honeymoon and anniversary!